The Lone Star Flight Museum (LSFM) inspires the aviators of the future with Texas’ rich, aviation past. Both an immersive aviation experience and a comprehensive education program, LSFM caters to students and visitors of all ages. Its engaging, educational environment includes a unique blend of history and science. By teaching history through science, and science through history, LSFM seeks to excite a lifelong learning of STEM subjects. 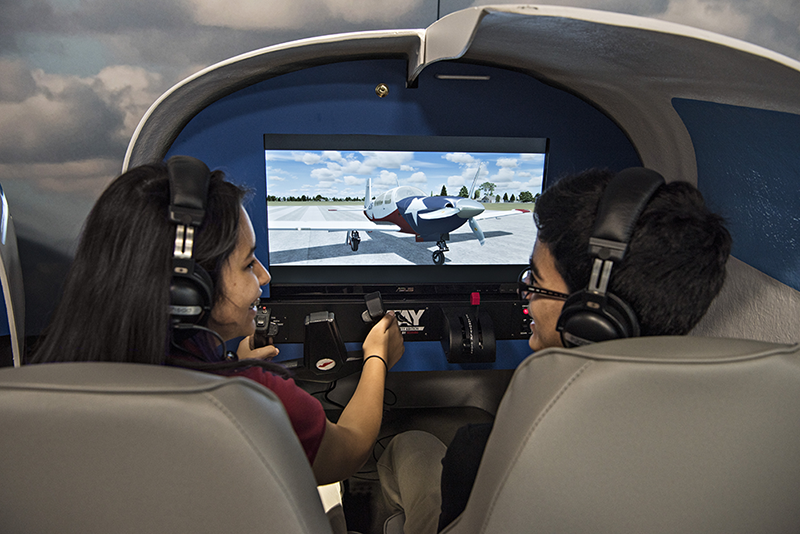 In the Aviation Learning Center (ALC), dynamic programming and interactive experiences abound. The ALC includes a Learning Lab, a Mooney Hangar, and a Simulator Bay with 10 Redbird Jay Velocity simulators. 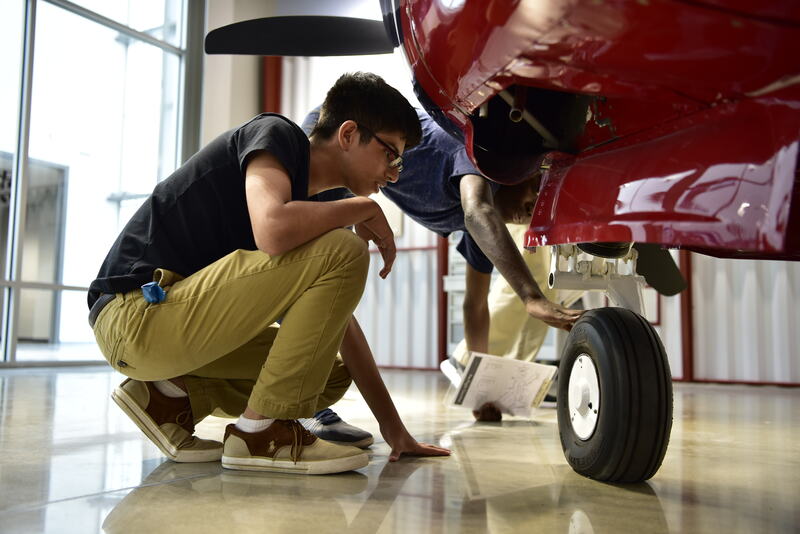 In the Learning Lab, students learn aviation concepts in a real ground school environment. With hands-on activities at each station, the students explore the principles of flight. These include flight dynamics, aircraft weight and balance, wings and airfoil design, weather, navigation, and aircraft instruments. Students also learn to preflight a real aircraft and “file” a flight plan. Kids and adults alike truly enjoy when it all comes together in the Redbird Jay Velocity sim bay. This is where everything they have just learned culminates in a gloriously fun flying experience. The Redbird Jay Velocity’s realistic graphics, smooth controls, and ease of flying make our students soar! When not in use to teach a class, the simulators are open to our general admission visitors as well. Take a first-hand look at the ALC. The approach to education at LSFM sets it apart. We use an engagement and empowerment strategy. We want our students to have fun, but we also want them to get something out of our program. LSFM wants to provide a great foundation that will inspire America’s next generation of scientists, engineers, pilots, and more. Having a diverse staff enables us to engage effectively with an equally diverse student population. We challenge them and set the expectation bar high. This environment breeds accomplishment and pride. Amongst our staff, we encourage authenticity, transparency, and consistency. After each field trip, our students leave feeling empowered—regardless of their gender, socio-economic status, or ethnicity. We enjoy great relationships with organizations in our local communities. To name a few, Phillips 66, Houston Airport System, Houston Livestock Show and Rodeo, Houston Independent School District, Boy Scouts of America, Civil Air Patrol, and Sea Cadets all support LSFM. In addition to providing financial and volunteer support, many of these organizations promote our education program to the 1.2 million students in the region. As a result, we’ve been able to achieve some pretty cool things. In September 2017, LSFM opened its doors at Ellington Airport. We hosted 100 young girls that month for the airport’s Girls in Aviation event. These young ladies kicked off our inaugural Aviation STEM season. The “Eyes Above the Horizon” event in November gave young people an opportunity to interact with active duty Air Force personnel, general aviation pilots, and various business professionals. In collaboration with the Legacy Flight Academy, we were able to positively impact more than 70 underserved youth. The kids even piloted a real airplane! We hosted 75 Cub Scouts and parents in our very first Scout Overnight event. The feedback was great! It was so rewarding engaging with the kids, teaching them principles of flight, discussing various careers in aviation, and exposing them to the wonderful world of aerospace. The DEA Youth Can Fly event launched at LSFM in February 2018. This was the first aviation-themed, drug prevention program in the United States. A Houston native, Mr. Morris joined the museum in December 2016. For eight years prior, he served in the United States Navy as an Antisubmarine Warfare Systems Operator (flying aboard P-3C Orion aircraft). In 2012, Mr. Morris established Universal Elite Aerospace, a non-profit organization where he developed, implemented and executed aviation-based S.T.E.M. projects, classes, and tours for local schools, churches and youth groups. B.K. is responsible for visitor-related activities and public programming at the museum. Prior to joining the museum staff in July 2017, B.K. was a volunteer for 2 years. As an active volunteer, she participated in many events and proudly served as a Crew Chief for the LSFM’s B-17 Flying Fortress and B-25 Mitchell Bomber. A private pilot, B.K. enjoys flying in her time away from the museum.